When most think of gaming laptops large bulky devices with aggressive styling and likely some RGB LED flare setting themselves apart from the pool of monotonous portables. 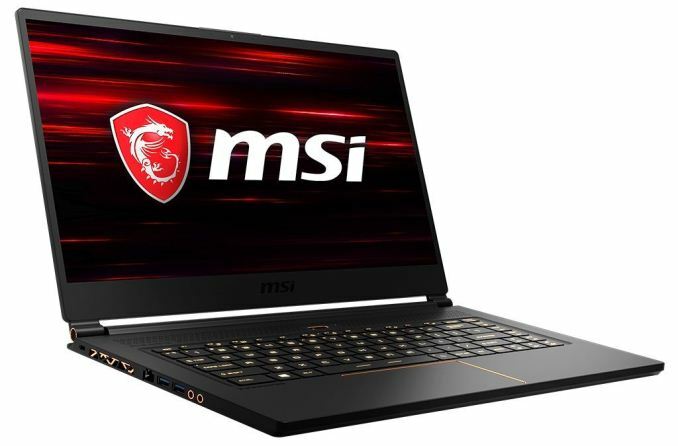 However, for their newest laptop being announced alongside Intel's 8th gen Core processors, MSI has gone in a completely different direction with their GS65 Stealth Thin, offering users a thin clamshell-style laptop along with an elegant black and gold design that doesn’t show its hand as to what is under the hood. 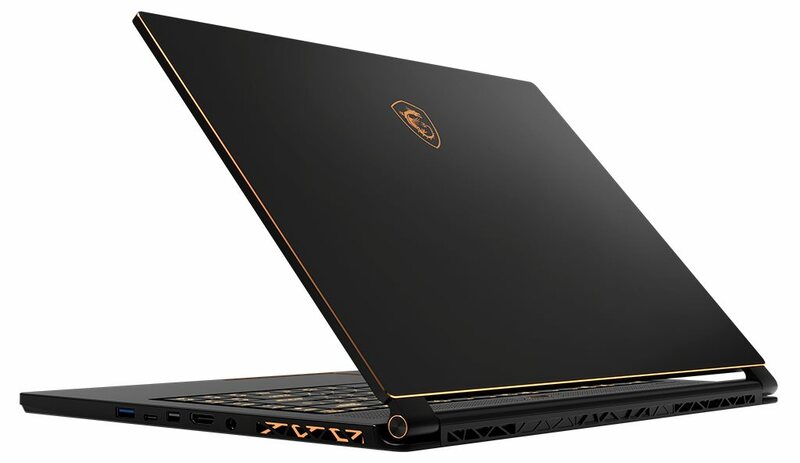 The GS65 offers users a 6C/6T 8th generation Intel processor and up to a NVIDIA GeForce GTX 1070 Max-Q GPU driving its 15.6” 144 Hz panel – all inside of a 4.14 lbs. 0.69-inch thin and stylish package. MSI’s gaming lineup is distinctive from their other offerings with a black and red theme and the typical ‘bling’ we are used to seeing. The GS65 tones it down quite a bit and gives users a sleek black base color along with gold trim around the frame. The MSI gaming dragon on the lid is also adorned with the gold color. About the only design queues on the outside telling us it is a fit for purpose device may be the vents located on the side and back. The Steel Series keyboard is RGB backlit controlled by their software. Outside of that, it just gives the appearance of a premium ultra-thin portable. The result is a sleek and portable 15-inch laptop that fits within a 14-inch device’s footprint. Just because it looks like something fit more for a boardroom than a game room, doesn’t mean it's lacking under that exterior. The GS65 uses the 8th generation Intel Core i7-8750 6C/12T CPU with speeds boosting to 4.1 GHz. There are two video card options – either a NVIDIA GeForce GTX 1060 6GB GDDR5, or GTX 1070 8GB GDDR5, both using the Max-Q technology from NVIDIA. The GPUs drive a 15.6” FHD (1920x1080) TN panel with a 144 Hz refresh rate, 7ms GTG, and 72% NTSC color gamut coverage – the only panel option. System memory ranges from 16 GB DDR4-2400 up to 32 GB with all options in a dual-channel configuration. For storage and connectivity, the GS65 only offers SSD storage and forgoes any platter based options. SSD options include both SATA and PCIe NVMe based devices ranging from 256 GB to 512GB. There is also a 1TB RAID0 option as well for those who would like ultra-fast storage. On the connectivity side of things, the GS65 includes three USB 3.1 Type-A ports, Thunderbolt 3 Type-C port, HDMI (2.0) and mini-DisplayPort (1.2) along with a mic/headphone combo jack. Networking functionality on the wired side is handled by the Killer e2500 Gigabit LAN while there is a choice on the wireless side. Users have a choice between the latest Intel 9560 solution supporting 802.11ac 2x2 with speeds up to 1.73 Gbps or a Killer N1550 combo offering the same 802.11ac 2x2 with Wi-Fi speeds also breaking the Gigabit barrier at 1.73 Gbps. All devices support Bluetooth 5.0. The GS65 Stealth Thin Gaming Laptop starts at $1799 with availability expected later this year. (H x W x D) 14.08" x 9.75" x 0.69"